Tom Perry has suffered a collar bone injury. 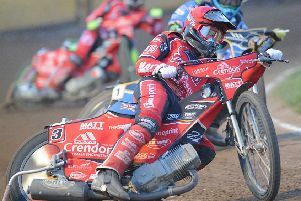 Peterborough Panthers have suffered a cruel injury blow as star man Tom Perry faces a spell on the sidelines. The ‘T Balfe Construction Panthers’ rider is on the casualty list after a crash riding for National League club, Birmingham last night. Perry was taken to hospital where tests confirmed he suffered a broken collar-bone and dislocated shoulder. Doctors also have concerns over a swollen knee. Perry has been a classy performer for Panthers at Premier League level. He was due to move into the main body of the team when they entertain Ipswich at the East of England Showground this Sunday (5pm) after piling up the points at reserve.